Obama spokesman Ben LaBolt said the rate was adjusted to account for a competing offer from another lender and other factors. "The Obamas have since had as much as $3 million invested through Northern Trust," he said in a statement. Modest adjustments in mortgage rates are common among financial institutions as they compete for business or develop relationships with wealthy families. But amid a national housing crisis, news of discounts offered to Sens. Christopher J. Dodd (D-Conn.), chairman of the banking committee, and Kent Conrad (D-N.D) by another lender, Countrywide Financial, has brought new scrutiny to the practice and has resulted in a preliminary Senate ethics committee inquiry into the Dodd and Conrad loans. Within Obama's presidential campaign organization, former Fannie Mae chief executive James A. Johnson resigned abruptly as head of the vice presidential search committee after his favorable Countrywide loan became public. Driving the recent debate is concern that public officials, knowingly or unknowingly, may receive special treatment from lenders and that the discounts could constitute gifts that are prohibited by law. "The real question is: Were congressmen getting unique treatment that others weren't getting?" associate law professor Adam J. Levitin, a credit specialist at Georgetown University Law Center, said about the Countrywide loans. "Do they do business like that for people who are not congressmen? If they don't, that's a problem." Under financial disclosure rules, members of Congress are not obliged to disclose debts owed to financial institutions for personal residences. Names of lenders and rates paid on mortgages sometimes can be determined by scrutinizing property transaction records. In March, in response to media questions, Obama posted on his campaign Web site records related to his house purchase. Last week, during debate on a bill to help homeowners caught in the foreclosure crisis, some members of the Senate ethics committee proposed an amendment to require that lawmakers disclose their mortgage lenders and loan terms in annual financial forms starting next year. In Obama's case, he received a lower rate than the average offered at the time in Chicago for similarly structured jumbo loans. He secured his final mortgage commitment on June 8, 2005, and during that week, rates on similar loans for which information is available averaged 5.93 percent, according to HSH Associates, which surveys lenders. Another survey firm, Bankrate.com, placed the average at 6 percent. "It's certainly safe to say that this borrower did better than average," said Keith Gumbinger, an HSH vice president, noting that consumer rates vary widely. "It's a good deal." The Obama campaign called the rate "consistent with Northern Trust policies, and it reflected the base rate set for that period discounted to address the competition for the account and other opportunities, such as personal financial services, that the relationship would bring to Northern Trust." When the Obamas secured the loan, their income had risen dramatically. Obama assumed his Senate seat in January 2005, with an annual salary of $162,100. That same month, Random House agreed to reissue an Obama memoir, for which it originally paid $40,000, as part of a $2.27 million deal that included two future nonfiction books and a children's book. Around the same time, the University of Chicago Hospitals promoted Michelle Obama to a vice president and more than doubled her pay, to $317,000. The couple wanted to step up from their $415,000 condo. They chose a house with six bedrooms, four fireplaces, a four-car garage and 5 1/2 baths, including a double steam shower and a marble powder room. It had a wine cellar, a music room, a library, a solarium, beveled glass doors and a granite-floored kitchen. The Obamas had no prior relationship with Northern Trust when they applied for the loan. They received an oral commitment on Feb. 4, 2005, and locked in the rate of 5.625 percent, the campaign said. On that date, HSH data show, the average rate in Chicago for a 30-year fixed-rate jumbo loan with no points was about 5.94 percent. Jumbo loans are for amounts up to $650,000, but the Obamas' $1.32 million loan was so large that few comparables are available. Mortgage specialists say that many high-end buyers pay cash. Obama's Republican opponent, Sen. John McCain, has no mortgages on properties he owns with his wife, Cindy, who is a multimillionaire. Unlike Countrywide, where leaked internal e-mails documented a special discount program for friends of chief executive Angelo Mozilo, Northern Trust says it has no formal program to provide discounts to public officials. Loan officers may consider a borrower's occupation when establishing an interest rate, the bank said. "A person's occupation and salary are two factors; I would expect those are two things we would take into consideration," said Northern Trust Vice President John O'Connell. "That would apply to anyone seeking to get a mortgage at Northern Trust." He added that the rates offered to Obama were "consistent with internal Northern Trust rates at that time." "The bottom line is, this was a business proposition for us," he said. "Our business model is to service and pursue successful individuals, families and institutions." O'Connell referred additional questions to the campaign. Since 1990, Northern Trust employees have donated more than $739,000 to federal campaigns, including $71,000 to Obama, according to the Center for Responsive Politics. reported that on the day of the closing, the wife of Obama's longtime friend and fundraiser Antoin "Tony" Rezko closed on an adjoining lot that had been the estate's side yard. The Obamas bought the house for $300,000 less than the asking price of $1.95 million, while Rezko's wife, Rita, bought the neighboring lot for the full asking price of $625,000. 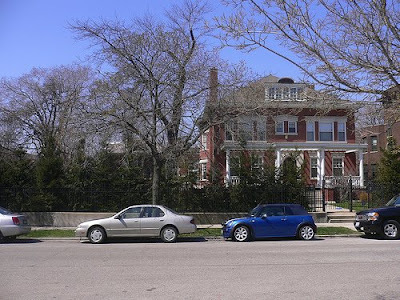 Rita Rezko later sold a portion of the undeveloped lot to the Obamas, enlarging the senator's yard. Note: What I find most interesting is that I paid more money down ($400,000) on my house than Obama did ($300,000) even though my house is less than half the price of his mansion, and he still managed to get a lower interest rate than I did. Also, why does a family of four need a house with six bedrooms and 5 1/2 baths? Talk about excess consumption. Why does a family of 4 need 5.5 bathrooms? As Obama himself put it: "We can’t drive our SUVs and eat as much as we want and keep our homes on 72 degrees at all times... and then just expect that other countries are going to say OK." Except your family, of course, Senator Obama.